This project demonstrates that the careful choice of low cost materials combined with the innovatory use of new products can create domestic architecture of real quality at very low cost. It also shows that it is possible to design a building in the context of the bodged ‘squatter architecture’ that typifies Dungeness Beach, which both re-invigorates this tradition and captures the unique spirit of the place. Although this project started life as a conversion project, by the time it was finished 75% of the fabric was effectively new build. This reflects the fact that when the original roofing and cladding were removed the softwood framework behind was found to be virtually non-existent, and it is something of a mystery how the building had not previously been blown away by the winter storms. Dungeness Beach in Kent is a classic example of ‘Non Plan’ and the houses that populate the beach have developed through improvisation and bodge. This scheme develops this tradition in a way that responds to the drama and harshness of the landscape. The original building, which itself is the product of a series of changes and extensions since it was built as a fisherman’s hut in the 1930s, has been stripped back to its timber frame, re-structured, extended to the south and east to capture the extraordinary views, and clad both internally and externally in Wisa-Spruce plywood. 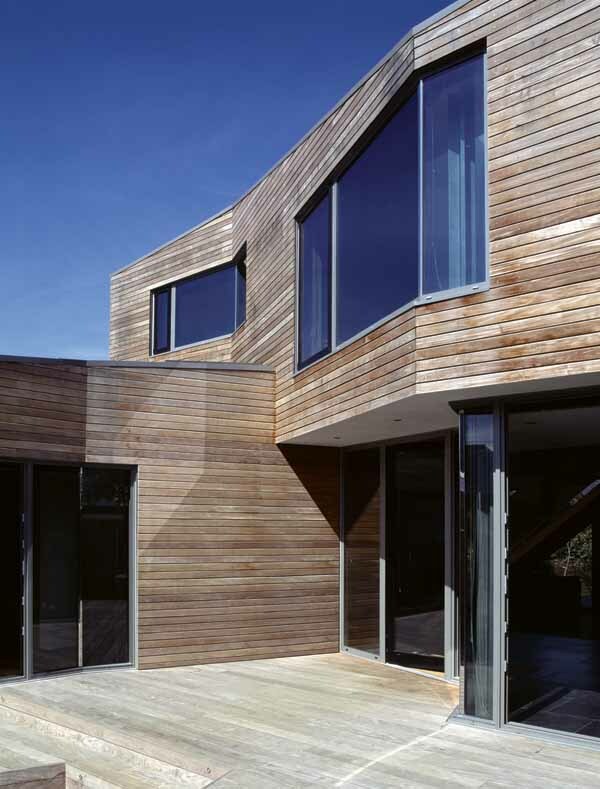 This plywood provides all the internal finishes, including walls, floors, ceilings, doors and joinery. Externally both walls and roof are clad in black rubber, a technically more sophisticated version of the layers of felt and tar found on many local buildings. The bath is cantilevered out over the beach giving dramatic views to the sea. Internally priority has been given to maximising the living areas and the house only has one small bedroom. Visitors are accommodated in a 1954 Airstream caravan which is parked next to the house, the silver of the aluminium caravan providing a striking visual contrast to the black rubber. • Water resistant yet vapour permeable. • Withstands extremes of temperature between -50°C and +130°C. • Elongation of over 400% with no degradation over time. • Resistant to ozone and UV. • Individual elevations including cut-outs for doors and windows can be manufactured in the factory with vulcanised joins between roll widths. The Wisa-Spruce plywood used for both the interior and external cladding of the timber frame was chosen specifically because it comes from managed forests in Finland. One of the characteristics of the beach environment is the constant wind and this, in combination with the black rubber cladding, combines to provide an energy efficient internal environment. In summer windows on opposing sides of the house are left open to provide positive cross ventilation which effectively dissipates the potential heat gain through the black rubber. In the winter the windows are generally closed and the black rubber acts as a heat sink with the result that the use of the back up heating system is minimised.